A small-sized digital SLR camera provides you with superior image quality without causing an excessive amount of wrist strain. No digital SLR can be as small and light as a compact camera. This is due to the system of mirrors inside the camera that reflect the image that passes through the lens up to the viewfinder. It's this system of mirrors that give digital SLRs their distinctive hump at the top where the built-in flash is located. For now, consider this: the easiest way to decide which camera type is best for you is to have a sense of what types of photos you want to take. Clearly, portability is an important factor - otherwise you wouldn't be reading this page. Just make sure that you don't give up some important features just for the sake of a camera that fits into your pocket. Digital SLR or Mirrorless Camera? In 2009 a new type of camera became available to consumers. It bore a great resemblance to a digital SLR but was more the size and shape of a compact camera. These "Mirrorless Cameras" might actually be a better option for you if size and weight are some of the most important factors affecting your decision to buy a new camera. Digital SLR - the letters SLR stand for "Single Lens Reflex" and what this really means is that inside the camera there is a system of mirrors designed to reflect the image captured by the lens up to the viewfinder. This entirely optical system ensures that when you look through an SLR viewfinder what you see is what you'll get when you take a photo. Even if you move the camera quickly to track a moving subject, the image in the viewfinder will remain clear. Mirrorless Camera - also called Interchangeable Lens Digital Cameras or Micro Four Thirds, these cameras omit the mirror system entirely. While this dramatically reduces the size of the camera body, it also means that the main way to compose photos is to use the camera's LCD screen - an electronic viewfinder rather than an optical one. So which is better: optics or electronics? The answer to this question depends on what types of photos you take and how often you want to carry your camera with you. If you want to take action shots, then mirrorless digital cameras are not ideal. Since you can't track a fast-moving subject using the viewfinder, it makes it harder to capture the peak moment of an action sequence. However, if you want to take portrait and landscape shots during your family vacations then a mirrorless camera should work just fine. Of course, the portability of a mirrorless camera depends entirely on the type of lens you stick on the front of it — it will no longer fit in a pocket if you slap on a huge telephoto lens. The cameras that I list below are the smallest currently available that still include a system of mirrors for the viewfinder. Since they are small, they are also the lightest – the camera bodies are made out of a hard plastic shell as compared to some more heavy-duty DSLRs made out of metal. Finally, many of these cameras are quite basic. The smallest and lightest digital SLRs made by the manufacturers are typically entry-level, designed for people just making the switch from a point-and-shoot to a digital SLR. 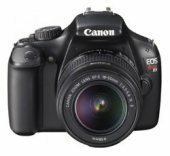 As DSLRs become more advanced and have more professional features, they also are larger and weight considerably more than the models listed below. With all these disclaimers out of the way, let's take a look at some small-sized digital SLR cameras. QUICK OVERVIEW: Entry-level, 12.2 megapixels, dust control, live view LCD, basic HD movie mode.